Earlier this month (December 2013), the British Department of Energy and Climate Change (DECC) introduced the strike prices that will be on offer to energy developers in the coming years. 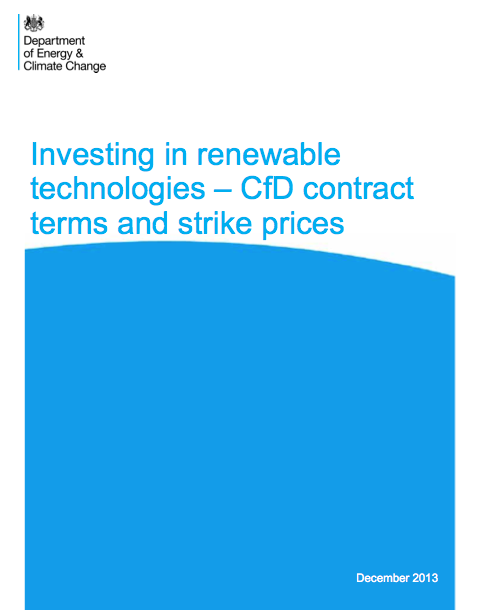 This new regime especially focuses on increasing investment in new renewable energy projects. According to Ed Davey, UK’s Energy and Climate Change Secretary, the new levels of support are designed to provide certainty to investors and will ensure the UK meets its 30 percent renewable electricity target in 2020 (doubling the current percentage of electricity generated from renewable sources, which now is 15 percent). The package will deliver record levels of investment in green energy by the end of the decade (GBP 40 billion) and is expected to attract investors from around the world so Britain can replace its ageing power stations, ensure access to sufficient electricity, reduce greenhouse gas emissions, and create green jobs. The geothermal industry is likely to welcome the plan by the UK Government to increase geothermal strike price by extra 20 GBP/MWh each year, meaning geothermal developers can expect at least 140-145 GBP/MWh in the coming years. It is also interesting, that hydropower schemes have been allocated a boost of extra 5 GBP/MWh, with strike prices to be 100 GBP/MWh. However, most of the new green electricity will come from offshore wind power, where the strike prices will be 140-155 GBP/MWh. It is worth having in mind that Iceland could most likely offer the UK base-load green electricity (from geothermal- and hydropower sources) at substantially lower prices than the average strike prices. A recent independent report by the well known management and consulting firm McKinsey, introduced a positive view towards constructing an interconnector (HVCD cable) between Iceland and Europe. According to McKinsey, such an interconnector could offer substantial cost savings for the buyer of the Icelandic electricity. 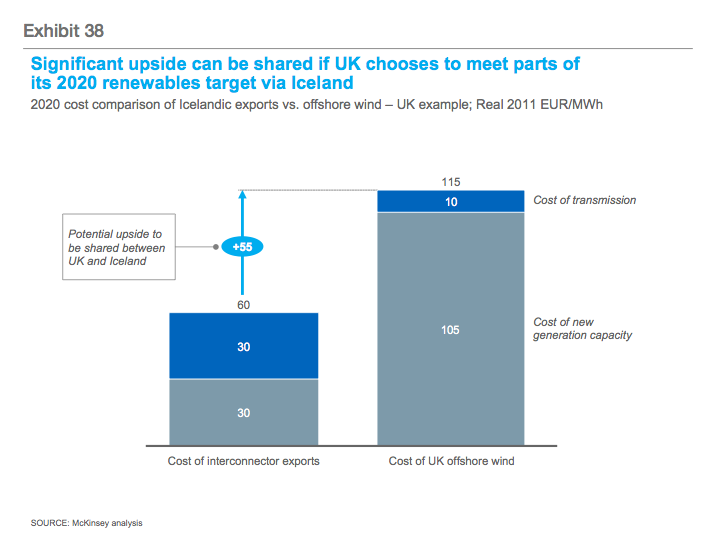 McKinsey puts forward the idea that price for the Icelandic electricity might be somewhere between 50-95 GBP/MWh (60-115 EUR/MWh). This is a much lower price than the UK strike price for offshore wind power. By sharing the benefits, offered by the cheaper Icelandic electricity, between Iceland and the UK the strike price for the Icelandic electricity could possibly be as low as 75 GBP/MWh (which is equivalent to 90 EUR/MWh and approximately 125 USD/MWh). 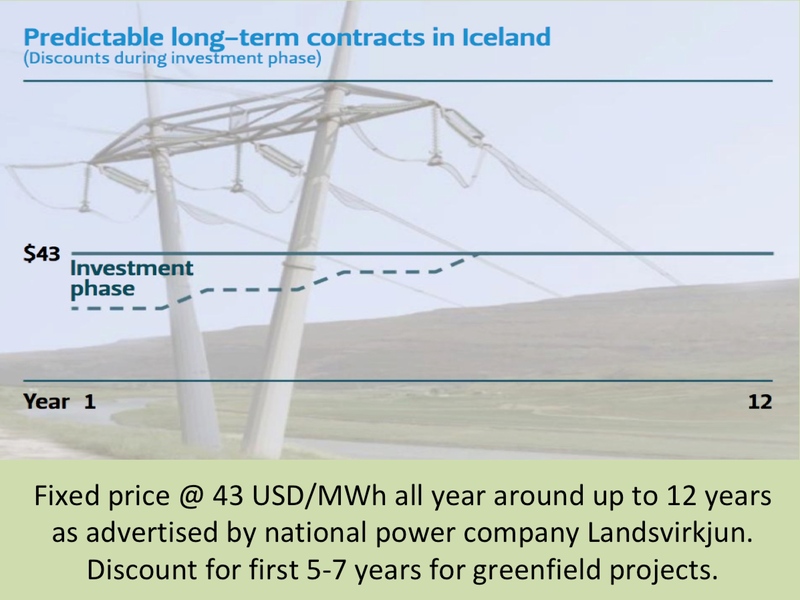 And even if the strike price for the Icelandic electricity would be close to 95-100 GBP/MWh (115 EUR/MWh or 155 USD/MWh), this would be lower than the British strike price for geothermal-, hydro- and wind power. Therefore it is quite clear that an electric interconnector between Iceland and UK is a very interesting business opportunity.